This is a candle. Obviously you're not going to light it, right? So it's a decoration, a sculpture made of just over a pound of wax, which isn't even scented: it just sits there, collecting dust, unless you put it under a bell jar. That base looks a little teetery to me, and if the sculpture falls over, it's going to be damaged, because wax is fragile. Aedes de Venustas is selling this for A HUNDRED AND TWENTY-FIVE DOLLARS. 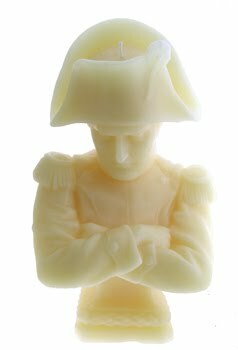 If that's not rich enough for your blood, you can get one of Napoleon Bonaparte, looking perhaps a bit more stable and made of just under three pounds of wax, for $175. 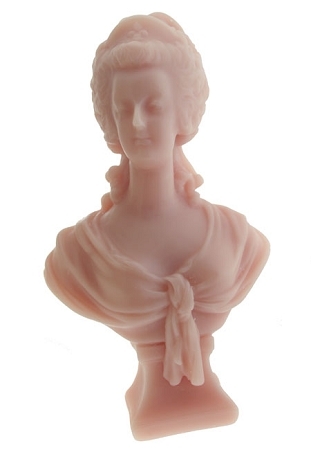 They're both from a French candle-making company called Cire Trudon, which says they are "wax busts....to be collected rather than consumed," in which case why do they have wicks? I really just don't get this at all. At least perfume them or something. I have never understood these types of candles either. Ive also seen the same idea in soaps. Someone gave me a gift like this years ago and I had it in one of my bathrooms for the longest time (because she would come over and I felt the need to display her gift). I hated that candle. I was always trying to dust it and keep it looking nice but it was a dust magnet. I finally burnt it one time just to see how it smelled and it didn't smell that great so one day I tossed it. Bad gift!! !